Hallelujah! Six months one week after I originally ordered a new floor pan for Project Nomad it finally arrived. I anticipated a few dramas with the restoration but nothing could have prepared me for what the last six months held. I knew from day one the floor pan was shot. 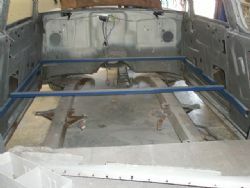 Given the structural integrity it brings to the body it was up there near the top of the “to do” list and a lot of the body work was dependent upon the floor pan being installed. The drama started when I ordered one through Chevy Spares in Queensland. The address I was given to pick it up from in Wetherill Park turned out to be a vacant block of land. The floor pan went missing in action so Chevy Spares supposedly ordered another one. Eight weeks later I was given another address in Wooloomooloo but again the place didn’t exist. Everything I was being told by Chevy Spares was a fabrication, and not the metal bending kind. After four months with no result, enough was enough. I learnt three lessons – don’t deal with Chevy Spares, don’t pay for anything in full in advance and the last lesson was don’t deal with Chevy Spares. I’d really like to tell you the whole ugly story but it is now in the past and we are moving forward once again. Empty handed and way behind schedule I ended up organising it myself. I ordered the floor pan through Restoration World in the US and the guys there understand customer service and are very helpful. The floor pan shipped from their supplier in Texas and the next drama started to unfold. 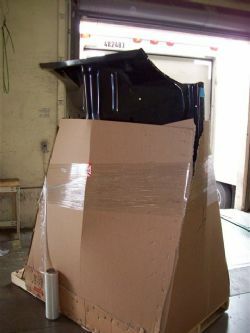 It was shipped on a pallet and for some reason I still don’t understand it only had half a cardboard box on it. The top half was sticking out of the box. I had arranged a carrier in Los Angeles to ship it to Australia in a container for me. 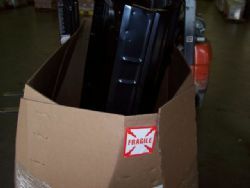 They rejected the shipment on the grounds that it would get damaged, took two photos for me and the floor pan was sent back to Texas. Two weeks of haggling to get it repacked and resent and they finally accepted it into their warehouse. Six weeks later it was delivered to Joscar and after nearly having a coronary at how much the shipping company gouged me I finally saw the piece of sheet metal that aged me ten years in six months. 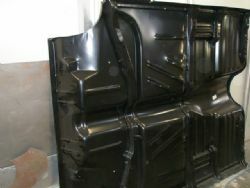 The advantage of this particular floor pan is it is one piece which means it is a lot easier to install and you don’t have unsightly welds everywhere. It also has the braces underneath along with the inner sill built into the pan so there is a significant saving on labour costs compared to constructing a pan from front and rear panels, braces and a transmission tunnel. This week Joscar are welding it in so Project Nomad will have a new belly. In a couple of week’s time the Nomad will leave Joscar and have the drive train installed so the articles will be coming thick and fast at that point. I can’t wait.